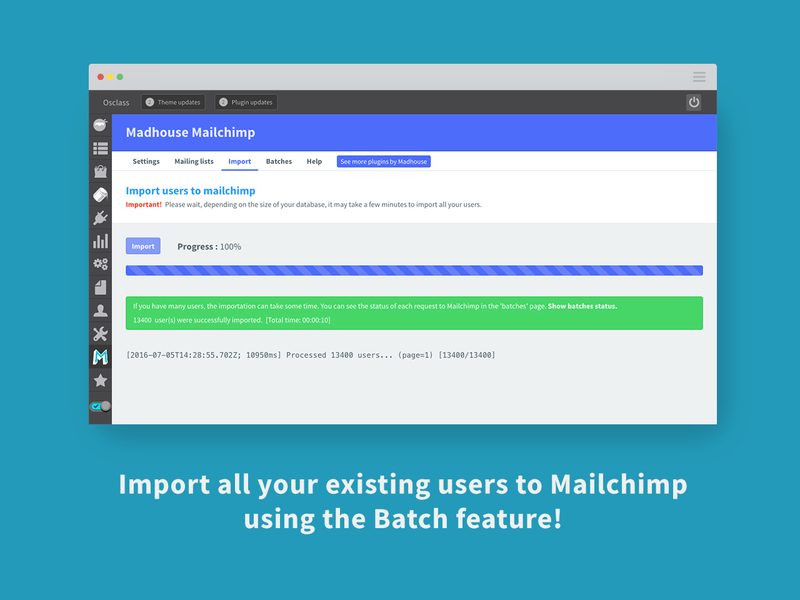 Madhouse Mailchimp is an integration plugin between Osclass and Mailchimp newsletter and email service. This plugin offers you to benefit from the awesomeness of Mailchimp to send newsletters to your Osclass users. 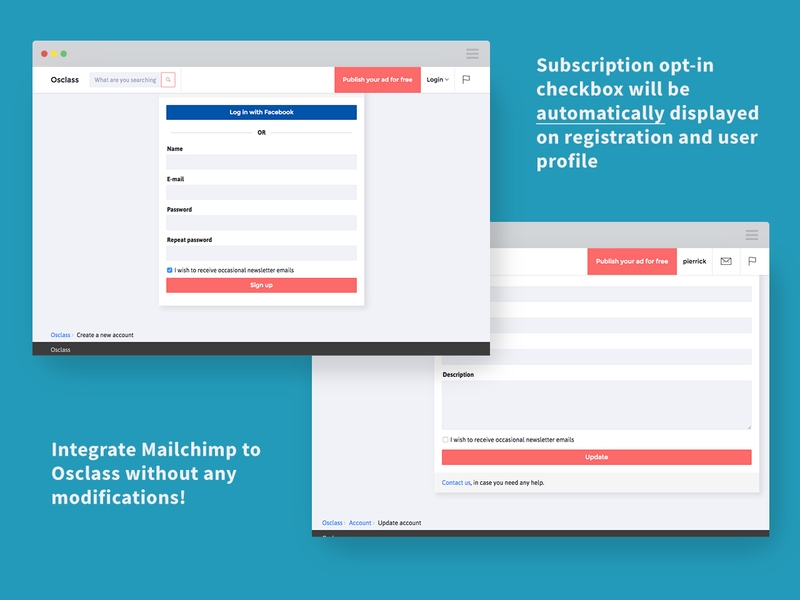 Import: the plugin offers an import feature to subscribe all your users to Mailchimp at once to instantly get started with your existing users database. The plugin will hook to the user registration page and user account page to add an opt-in checkbox to encourage you users to subscribe to your newsletters. You won’t have to do any modification to your theme as long as it follows Osclass guidelines on hooks. The plugin offers many settings to manage the mailing list to which your users will get subscribed on Mailchimp. 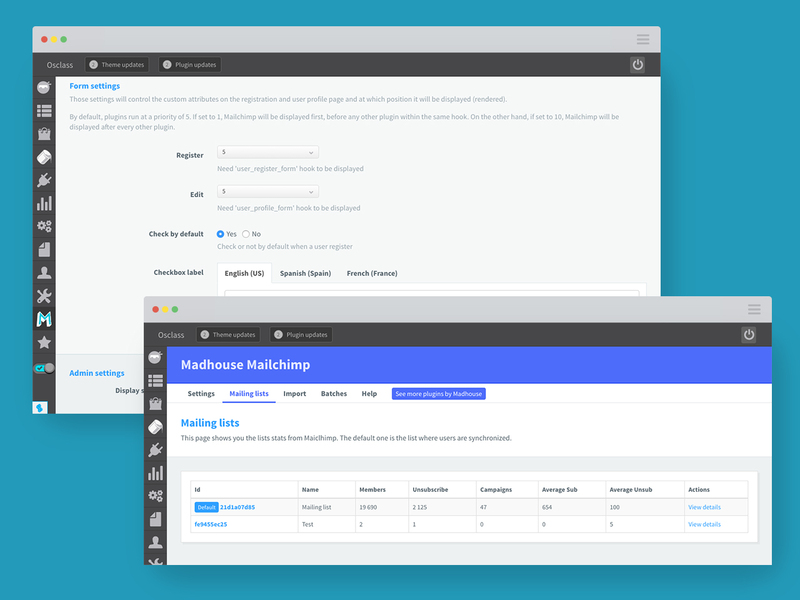 Madhouse Mailchimp provides also an overview of your mailing list and some useful statisctics right in the administration panel. To ensure that your Osclass database is always up-to-date, the plugin uses Mailchimp webhooks to synchronize your users. The import feature will let you catch up with your existing database and subscribe your users to your newsletter when installing the plugin. It uses a smart import strategy to ensure that we can import all of your Osclass users, whatever the number.